Kathryn Gilhuly is a wellness coach based in San Diego. She helps doctors, nurses and other professionals implement lifestyle changes that focus on a healthy diet and exercise. Gilhuly holds a Master of Science in health, nutrition and exercise from North Dakota State University. Sweet potatoes belong to the starchy vegetable carbohydrate food group. 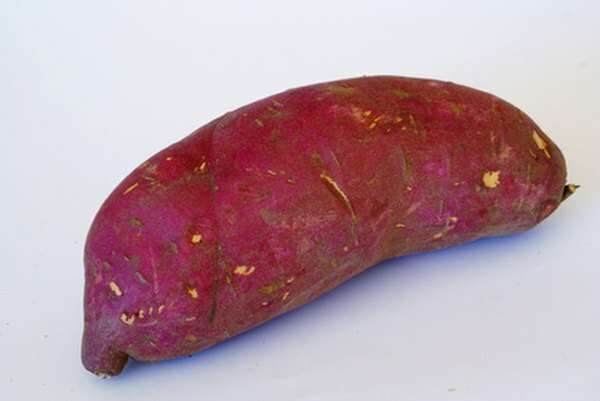 They provide dietary fiber, potassium, folate, vitamin A and vitamin C. The versatile sweet potato -- you can enjoy it baked, boiled and mashed, in salads and in smoothies -- contains 160 calories in 180 grams, or one large potato. Adding sweet potatoes to your diet may benefit your heart, your gastrointestinal health and your waistline. If you want to lose weight, you may benefit from incorporating sweet potatoes into your daily diet. One large baked sweet potato weighing 180 grams contains 6 grams of dietary fiber, or about 25 percent of the recommended dietary allowance for women. The Academy of Nutrition and Dietetics reports that diets high in fiber-rich foods are associated with lower body weights. According to the American Heart Association, high-fiber foods help to curb hunger so that you are less inclined to overeat. Eating foods that are rich in fiber can make you feel fuller, faster and on fewer calories. The potassium in sweet potatoes may help to lower your blood pressure and promote your heart’s health, according to the American Heart Association. A 180-gram large baked sweet potato contains 855 milligrams of potassium, or about 18 percent of the recommended dietary allowance for adults. Dietary potassium helps to regulate fluid balance in your body, which plays a key role in blood pressure regulation. The high fiber content of sweet potatoes may also contribute to lowering your blood pressure, blood cholesterol and cardiovascular risk. Sweet potato fiber may help to lower your risk of developing Type 2 diabetes. The large amount of fiber in sweet potatoes reduces their glycemic index -- a measure of a food's propensity to raise your blood glucose level. Boiled sweet potatoes have a glycemic index of 44 -- a relatively low rating. Therefore, sweet potatoes are unlikely to cause your blood glucose level to rapidly spike. The fiber in sweet potatoes slows digestion and absorption, which helps to stabilize your blood glucose level. Maintaining a normal blood glucose level is the hallmark of Type 2 diabetes prevention. Sweet potato fiber can help to improve your digestive health. Fiber-rich foods such as sweet potatoes soften and add bulk to your stool, which prevents constipation. Fiber, especially soluble fiber, also absorbs excess liquid and helps to solidify loose, watery stool. Dietary fiber is essential for normal gastrointestinal function. An adequate fiber intake -- about 25 grams a day for women -- helps to prevent disorders such as gastroesophageal reflux disease, duodenal ulcer, diverticulitis and hemorrhoids, according to a review published in the April 2009 issue of "Nutrition Reviews." Are Dried Blueberries as Healthy as Fresh Blueberries? What Are the Health Benefits of Dried Fruits? Do Carbs and Sugar Cause High Cholesterol?